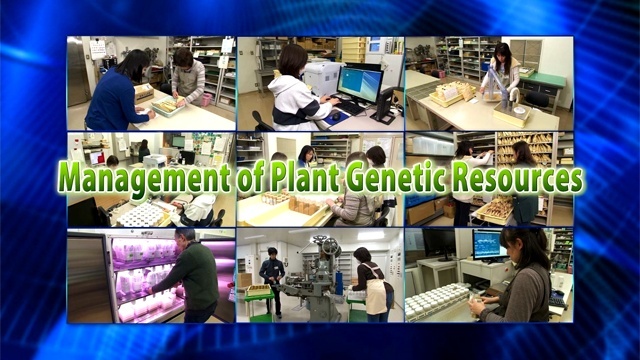 The Plant Section conducts exploration, collection, characterization, preservation and multiplication, and distribution services of plant genetic resources in collaboration with Sub-banks located across Japan, with the Genetic Resources Center, NARO acting as the Central Bank. The plant species covered are the following 12 groups. The Plant Section has been dispatching both domestic and overseas exploration teams every year and making efforts to survey the distributions and variations of plants as well as to collect versatile genetic resources. The total number of newly registered plant genetic resources amounts to over 5,000 items per year, including items obtained by exchanges with domestic and overseas research institutes. Part of the activities of such exploratory collections is made open to the public in the Annual Report on Exploration and Introduction of Plant Genetic Resources [ja]. Collected plants are identified and characterized by expert researchers. Cultivation for seed multiplication is conducted at the same time. The harvested seeds are preserved in a low-temperature and low-moisture environment over the long term. The number of registered items is about 224,000 as of 2016. The information on the histories and properties of the registered genetic resources is added to the database from time to time and is made open to the public through the Internet. The database can be searched by property, and information on any genetic resource with the desired properties can easily be obtained. The genetic resources preserved at the NARO Genebank can be used via a distribution request for testing/research or educational purposes. Distribution of 5,000 - 10,000 items has been made every year to both domestic and overseas research institutes, contributing to research and development etc. in genetic analyses, analyses of diversity and physiology/ecology, and as raw materials for food processing. Our Plant Genetic Resources are expected to bring about major developments in future agricultural fields, as exemplified by “Nipponbare” whose whole genome information was analyzed by a group composed mainly of the National Institute of Agrobiological Sciences (NIAS) and “Wataribune”, which is utilized as brewing rice.